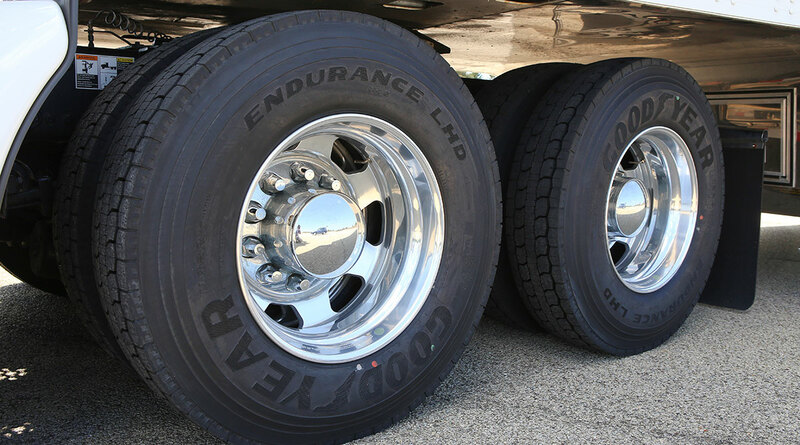 At the North American Commercial Vehicle Show on Sept. 27, Goodyear said the new Endurance LHD is now available and will replace the G572 and G572A models. Mahesh Kavaturu, a senior marketing manager for the Akron, Ohio-based manufacturer, said LHD was designed to maximize miles driven before removal and that it is verified for the SmartWay program of the Environmental Protection Agency. The new tire is available now in many but not all sizes, and by January it can be purchased in all sizes, Kavaturu said. In the tire’s name, LHD stands for longhaul-drive. The company’s preferred steer-axle tire to go with LHD on a tractor is the G399A. The tire is warrantied for seven years, Kavaturu said, and will probably go through three retreads during that time. Retreads for LHD will be available during the summer of 2018. Most of the changes in LHD from the 572 series are related to chemistry. Kavaturu said there are three new compounds in the tire: for the cap that actually touches the pavement, for the base underlying the cap and for the sidewall casing. “They all look black but they are different,” Kavaturu quipped on the three compounds. Goodyear managers define a highway tire as one that works best for a truck that spends a strong majority of its time on an interstate or similar road. Irregular route truckload and less-than-truckload linehaul are both longhaul to Goodyear. Trucks that make a lot of turns in urban or suburban areas are considered regional haul for the tire maker.